Your local butcher is a great resource. With the rise of massive out of town supermarkets that sell everything including the kitchen sink, the British high street can sometimes look rather badly stocked in terms of produce, but more and more people are realising the benefits of using their local shops and suppliers. The key benefits fall into three key areas - responsibility, locality and quality. This deals with the importance you place on sustainability, fair treatment of suppliers and what goes on behind the scenes with your food. A local butcher will invariably be keen to tell you where they source their meat from, the slaughter process and what storage methods they use. You are unlikely to find a butcher that has Hungarian chickens that have been in cold storage for a number of months - although that can happen in the supermarket and you won't even know it. There is also growing concern that the power large supermarket chains have over their suppliers is causing an unfair balance of power - it has been widely reported that many farmers only receive 3p per chicken from supermarkets, which is encouraging intensive farming methods. Supermarket price wars mean that farmers are scared to loose their livelihoods but are despairing at the market forces they are involved in. This touches on the responsibility factor, but with a clear difference - you are supporting your local high street. The impact of large, out of town supermarkets on the high street is clear - just walking down a normal British high street you will probably see a number of charity shops, pound shops and chain stores. The decline of family run butchers, fishmongers and grocers is a very sad indication of our quest for cheap food. However, this seems to be changing as consumers realise the difference they can make by using local suppliers for as much as possible. The common complaint about using local shops is that they can be more expensive than the supermarkets - no 'three for two' or 'buy one get one free' on already cheap food - but how much of that do you need? How much of it do you throw away? 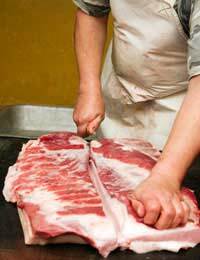 The cost of using your butcher will inevitably decline as their popularity increases anyway. There is no doubt that a long-time local butcher will have incredible knowledge about how to utilise different cuts of meat, what is best for a particular dish and much more. You may find that the price, initially, is comparable or even a bit higher than your local supermarket, but if you ask yourself how two chickens can be sold for £5 and what type of life they must have had, you may want to have well-reared meat less often than a plate full of cheap meat every day. Those said, in using your local butcher he can recommend cheaper cuts of meat that you may not have tried before or suggest good value meal ideas. He may also sometimes throw in the odd extra chop or slice of something that will bring down your overall spend. There is another desirable by product for utilising your local butcher, too. Perhaps instead of dashing round the supermarket, piling your trolley with curiously cheap meat that you may or may not cook and enjoy, you can build a rapport with your butcher and gain a new recipe repertoire that will offer your family a valuable, 'sit round the table' meal time. It’s a great idea, and I agree completely. The problem is, if you live in a city now, finding a local butcher. Some neighbourhoods will have one (if you’re lucky) but they tend to be richer areas. Of course, most people prefer the convenience of being able to buy everything at the supermarket, which doesn’t help the return of the butcher. Wholeheartedly agree with this! I live in a large village/ small town with two butchers. They are so knowledgeable and helpful and always try to use local produce so you know which animals/herds the meat is from, how they have been treated and even that the food miles involved are not too high.